The Lord's Supper is a precious time for Christians. We remember the incredible sacrifice Jesus made to save us from our sins. We also realize that when Christians gather together and take the Supper, we are the Body of Christ, his physical presence on this earth (cf. 1 Corinthians 10:17). Whatever happens to one of us matters to the rest of the Body. 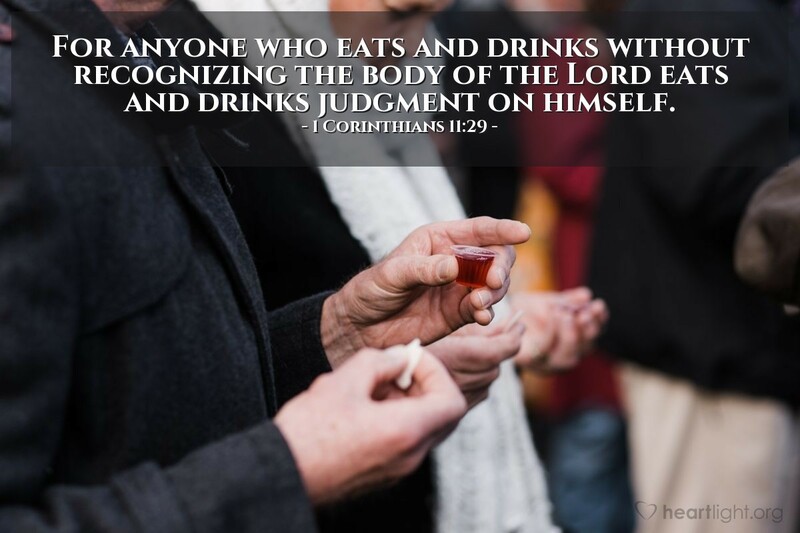 Every time we take the Supper, let's remember the other members of Christ's Body around us. Let's also give thanks for Jesus, who offered his body and blood at Calvary to save us. At the same time, let's commit to be the presence of Christ in the world and do his work. Father, thank you for the first incarnation of Jesus when he became flesh and lived on earth. Thank you for his second incarnation through his Body, the Church. Please help me to value other members of his Body more. Please bless me with wisdom and courage as we (our congregation) seek to truly minister as his presence in our world. In Jesus' name I pray. Amen.